The Ninja Librarian: Great Escapes Tour: Dumpster Dying. Review and Interview! Great Escapes Tour: Dumpster Dying. Review and Interview! We have a special treat today--not only my review of a really fun read, but an interview with a major character! Publisher: Creekside Publishing, 2016. 248 pages. Source: Electronic review copy as part of the Great Escapes free blog tour. Emily Rhodes came to rural Florida for the cowboys, the cattle, and to do a little country two-step, not to fall head first onto a dead body in a dumpster. Ah, the golden years of retirement in the sunshine state. 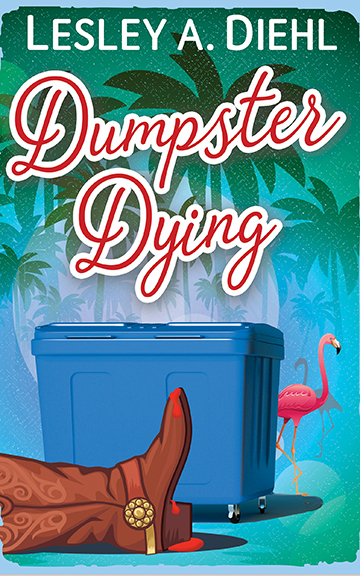 They're more like pot metal to Emily Rhodes, who discovers the body of the county's wealthiest rancher in the Big Lake Country Club dumpster. With her close friend accused of the murder, Emily sets aside her grief at her life partner's death to find the real killer. She underestimates the obstacles rural Florida can set up for a winter visitor and runs afoul of a local judge with his own version of justice, hires a lawyer who works out of a retirement home, and flees wild fires -- hand-in-hand with the man she believes to be the killer. I thoroughly enjoyed this book. I maybe had an especial appreciation of the fact that the main character isn't a sweet young thing, but a mature woman. I might relate better to Emily than some (okay, I really relate to her inability to keep from spilling things on her shirt-front). Besides Emily, the book has a strong cast of characters, some of whom are characters in the sense we mean when we say "he's a real character." And everyone seems to have some kind of secret. The writing is tight and well-edited, and the plot is interesting, convoluted, and well worked out. I guess a few things before the end, but for some reason (in retrospect it's staring me in the face) not the murder itself. That might be because, with so much going on (fires and lawsuits and bartending and adult children being difficult), I almost forgot about the murderer. Fortunately for everyone, Emily doesn't forget, and she pulls it all together just in time for an ending well suited to a place that claims to be the last bastion of the wild west. I was a little surprised at first by the point of view occasionally shifting (in a proper manner) to not only the police detective but also to other characters. It's unusual in the genre, but seems to work. I enjoyed seeing a few things from Detective Lewis's perspective, though I might not (as a writer) have used some of the others. In the end, this was only a minor distraction, and didn't prevent the book working well. The hints of romantic possibilities remain just that: hints, at least for this book. I'll be reading #2 soon, and then maybe I'll know if Emily's done mourning! Most fans of cozy mysteries should enjoy this one. The setting is interesting and well-drawn, the characters are a load of fun, and the story moves fast and keeps the reader turning the pages, with just the right amount of peril. I give bonus points for making the heroine someone who'll never see 50 again. 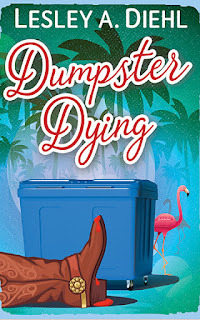 FTC Disclosure: I received an ARC of Dumpster Dying from Great Escapes Free Book Tours, and received nothing further from the writer or publisher in exchange for my honest review. The opinions expressed are my own and those of no one else. I am disclosing this in accordance with the Federal Trade Commission's 16 CFR, Part 255: "Guides Concerning the Use of Endorsements and Testimonials in Advertising." 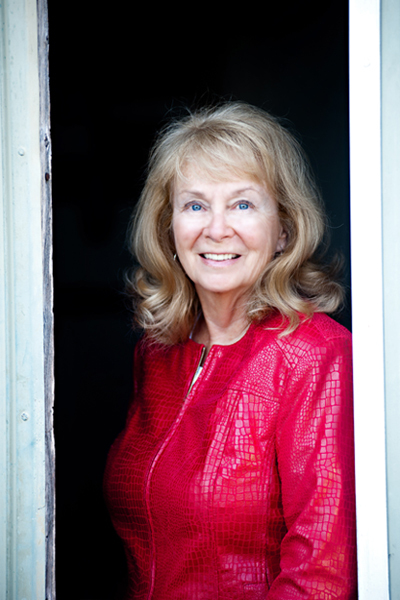 About the Author: Lesley retired from her life as a professor of psychology and reclaimed her country roots by moving to a small cottage in the Butternut River Valley in upstate New York. In the winter she migrates to old Florida-cowboys, scrub palmetto, and open fields of grazing cattle, a place where spurs still jingle in the post office. In her words, "I come to the "Big Lake" to write, hang out in cowboy bars, and immerse myself in the Florida that used to be. No beaches, no bikinis, no sand. Just cows, horses, and gators." And now for a visit from Detective Lewis! My name is Detective Stanton Lewis. I’m not certain how I got talked into this, but for some reason readers seem to be interested in my point of view as a detective. I love my job as a homicide investigator. I’ve worked in rural Florida for most of my career except for the few years I was on the force in Brunswick, Georgia. I liked the work there, but my personal life in Brunswick was hell. That’s another story, but you can read all about it in Grilled, Chilled and Killed. In retrospect I should have told Emily about those years, but I didn’t. I always tell people that their secrets always catch up with them, so it’s better to be up front about your past. I should have taken my own advice. Emily may be barely five feet tall, but she’s a real pistol when she’s made. And was she hot when she learned about Adrienne. So I was saying how I like my work in rural Florida. I’m not crazy about developers who come in here, thinking they can change things for the better. Folks around here kind of like the rural flavor of the place and aren’t real keen on filling in swamps and building condos. I think most folks who come to Florida to vacation or spend the winters prefer the mouse village at Disney or the coasts and find all the scrub land, palmetto, scraggly sabal palms and the alligators around here a bit off-putting. Especially the alligators. That’s fine with me. The fewer people who come here, the less work for me. Not that there aren’t problems with locals. Like the guy who decided to take a dip in Nubbin Slough at two in the morning and lost his arm to a gator. What a dumb a__, uh, idiot. I guess there’s no avoiding what problems booze and drugs cause, not even out here. Then there’s the issue of attitude. Some of our winter visitors think because we’re country folks that we’re dumb or because this is wild, untamed Florida with a lot of swamps and fields that we’re a big garbage dump where they can toss their cans and fast food wrappers. Oh, the locals do it too. It’s just that it accumulates here in the winter when the population of visitors soars. And speaking of attitude, Emily Rhodes, whom I came to know through a murder investigation, has a boat load of it. Like I said, she’s a bitty little thing, but she can get under a man’s skin. I’ll admit she’s real pretty with those blue as the south Florida sky eyes and her blond hair, but she also thinks she can do my job better than I can. She’s stumbled onto two dead bodies already, and I’m worried she thinks this is some kind of sign she’s meant to solve these cases. They are my cases! I try to follow up on a lead and she’s already there with some hypothetical about what’s going on. It’s darn aggravating especially when she looks up at me with those round, innocent eyes. What I really hate most is that she’s been right more than not. And I also don’t like the way I feel when I’m around her. The last time I got those feelings I ended up engaged. Well, that’s not going to happen again. I just wish I didn’t make such a durn fool of myself when we run into each other. Aside from her, the only other aggravation in my life is my partner Toby. The chief hired him because Toby begged and the chief and Toby were classmates at the academy. Toby is a fat troll as far as I’m concerned. He spits tobacco into that spit can he keeps in his office. It smells so bad in there that no one wants to go in, and the cleaning crew refuses to touch the can. Toby sometimes leaves it there for weeks before he empties it. I noticed lately that he’s grown a full beard. It came in white , but because of his chewing and spitting, the mustache is yellow and brown and so is the hair below his lip. He’s also the laziest cop I’ve ever met. People call into headquarters to report Toby sleeping in his cruiser under the shade of a tree, and it’s usually the tree outside the Burnt Biscuit Bar and Restaurant. He finally got caught in one of his schemes, kicked off the force, but then assigned the job of an undercover snitch for the department. My bet is that he finds out some way to make that assignment work in his favor and makes some money under the table. Of course, it’s my job to keep an eye on him. Why does he always get away with stuff? Well, maybe not this time. Let me ask you something. Do you think I have a chance with Emily? Should I ask her out? Oh, never mind. She’ll blow me off and I’ll just feel like an idiot. Gotta call Toby to check up on him. Stanton disconnects and drops his head into his hands. And...one last bonus! A giveaway, with a special prize: the winner's name gets to be used for a character in the next book! Nice blog (: I just started mine up and was looking for a few relative friends in the book world! I have a Booktube channel too. Also, There is a giveaway currently going on and I will be posting more as soon as I finish editing a few videos. Thanks for coming by. I'll take a look.